The Atmos 50 provided the space I required for most weekend hikes that I take or it was small enough for overnight hikes without being overkill. I also looked at the Atmos 60 and one thing I did like over the 50 was the addition of the bottom access it provided for getting to sleeping gear quickly (since that's where it generally goes in my bags). I couldn't justify the cost difference just for an extra zipper at the bottom. 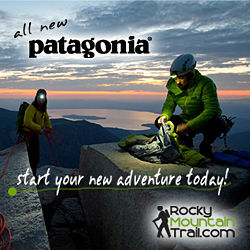 After fitting it with a load at a local REI, my mind was made. Two of the biggest selling points for me was the AirSpeed suspension system. 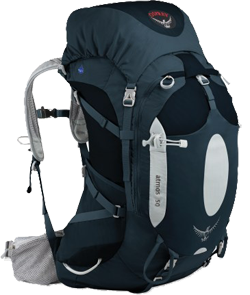 The AirSpeed is a mesh suspension system that lifts the pack off of the back and allows air flow. The thought of my back not being a sweat soaked mess was definitely a plus. The hydration system, being the other big seller, was something new to me coming from external frames. I was set in my way of having used soda bottles littered all over my pack depending on how I wanted to distribute the weight involved. I also had a Dana Designs (yeah, remember Dana Designs?) extension pocket that I tied into the front to keep yet another bottle of sloshing water bouncing on my hip all day long. The thought of keeping all of my water on my back and having it easily accessible all day long was a novelty to me and one that I still treasure. I know, welcome to the 21st century Scott, you've been away from hiking too long. I had purchased an insulated CamelBak (which is really bulky) disregarding the Osprey Hydraform as recommended. The issue was the hydration pocket is really meant for the HydraForm since it has a flat back and doesn't interfere with the AirSpeed. I ended up having to slot the CamelBak further into the main compartment to prevent that. I now have a Hydraform. Onto the storage, this thing has exactly the amount of space I need for my weekend treks. It keeps me to a minimum on cramming in extra items but, I still always have plenty of space should I ever need to do a longer trip. The main compartment is large enough for my food, extra clothes, and sleeping gear. I can always stash an outer layer near the top and drawstring the entire mess down easily. There are two outer pockets on the rear that run the length of the pack. I typically keep easily accessible items like my Vibram Five Fingers, rope, first-aid and anything else that may need fairly quick access or can be accessed by your hiking buddy as needed without removing the pack. For even more storage there is a stretchy wet/dry type pocket across the back. This is great for smashing in dirty clothing or sweat soaked gear. That pocket really stretches out too. It's kind of magical. There are also a couple of side pockets that can be lashed with the compression straps either on the outside or re-routed internally to free up the pocket more. I generally just keep my spare CamelBak bottle here and maybe a map. The top pocket is typical for these packs and I keep my rain gear, sunglasses, and pack cover here with a ton of extra room to spare. The shoulder straps are rather unusual (at least for m) as they're perforated and curved in a bit. It makes for an ergonomic fit and keeps it breathable. The downside is that a skinny person like me with an exposed clavicle, the straps tends to cut into me a bit after a long day. Otherwise it's a very comfortable fit. The waist belt on the other hand could be problematic for some people as it is not removable. So, again, if you have a small waist please be sure to get fitted before picking one of these up. I have mine cinched up all the way at about a 30 inch waist and it just barely holds on to me. Extra layers or padding could probably solve this but I am typically in lightweight gear. Extra accessories include quick stowage for trekking poles, ice axe hooks (I want to buy some just to look cool hiking), zipper pockets on the waist belt, and nicely done compression straps to squish everything down. I am very impressed with the quality of everything so far and Osprey's promise is to always repair any damage from failure of their packs for free which is great. I am very pleased with the purchase and conversion from external to this style of pack. Osprey has made a quality product and I can see this one lasting for a number of years before failure. I liked Osprey so much that I picked up one of their day packs (Manta 20) which I will review once I get it out on the trail. I am impressed with pretty much everything on this pack so far and the only failing would be the shoulder straps which isn't really a failing other than me being a super skinny guy.